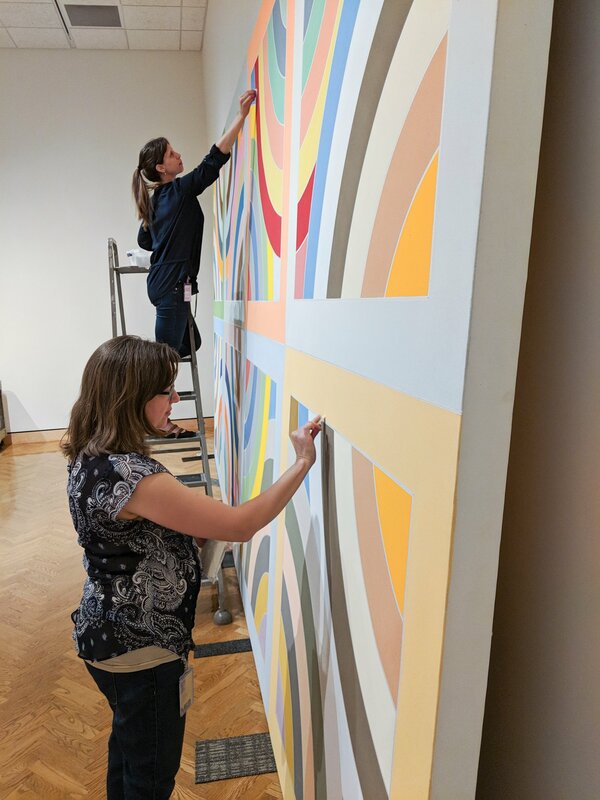 Conservation of Frank Stella’s “Tahkt-I-Sulayman Variation II” (69.132) in gallery 374; Conservation services provided by Midwest Art Conservation Center; Project sponsored by Bank of America. Grant funds from Bank of America were used to conserve the Minneapolis Institute of Art’s painting Tahkt-I-Sulayman Variation II (1969) by Frank Stella. The painting required structural and cosmetic treatment, including cleaning the surface of the work to remove dust, dirt, and fingerprints. A few areas were marred by mechanical damage and accretions, and there was a small puncture in one area of the painting. Treatment reduced and removed surface accretions when possible and repaired the puncture. The reverse of the canvas also required cleaning, and the strainer was replaced to maintain proper tension of the canvas support. Finally, backing boards were added to significantly improve the structural integrity of the piece. In addition to supporting the conservation of this important work, funds from Bank of America were used to create a related video on this incredible painting. Conservation generously funded by a grant from the Bank of America Art Conservation Project. Of Max Beckmann’s nine triptychs, Blind Man’s Buff is the largest and arguably the most important. The work was painted during Beckmann’s exile in Amsterdam between September 1944 and October 1945, under difficult wartime circumstances. In his journal, Beckmann refers to air raids and lack of food, coal, and electricity; in fact, much of the triptych was painted by candlelight. Since the Minneapolis Institute of Art acquired it in 1955, Blind Man’s Buff has consistently ranked among the museum’s top-five important artworks. Despite its controlled environment, the triptych had grown increasingly fragile, its structure unstable and surface deteriorating. The triptych’s conservation treatment was conducted over a four-month period in 2013 by the museum’s art conservation provider, the Midwest Art Conservation Center (MACC), under Mia’s supervision. MACC is a nonprofit regional conservation facility housed within the museum, making frequent conservator-curator consultation throughout the treatment possible. Acquired by the Minneapolis Institute of Art in 1973, the statue of Saint Paul the Hermit remained a mystery for the longest time. It was exhibited with an attribution to the 17th-century sculptor Francesco Mochi, when in fact the sculpture was made more than a full century later, by the important sculptor Andrea Bergondi. (Bergondi continued to employ a Baroque visual language despite the dawn of Neoclassicism.) Moreover, the statue had been mounted in an awkward way in the 1960s, tipped forward by about 45 degrees, which impeded its correct reading and understanding. 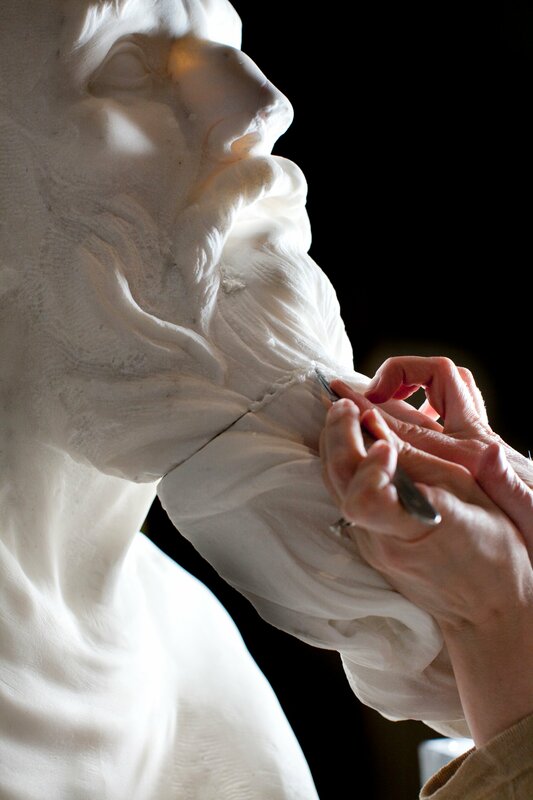 An exhibition during the Spring of 2012 documented the research and conservation process that took place to restore this statue to its original position and glory. It also shed light on other aspects, from carving technique and construction to the sculpture’s original context, meaning, and history. The conservation was carried out by senior objects conservator Donna Haberman and associate objects conservator Nicole Grabow of the Midwest Art Conservation Center (MACC). The exhibition was supported by the Samuel H. Kress Foundation. 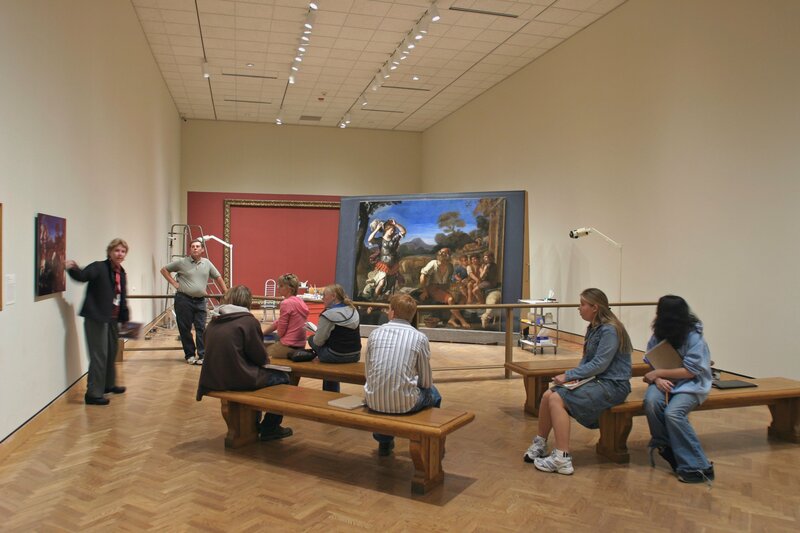 Over the course of ten weeks in the fall of 2004, paintings conservators Joan Gorman and David Marquis of the Midwest Art Conservation Center conducted a major conservation treatment of Guercino’s Erminia and the Shepherds during public viewing hours. 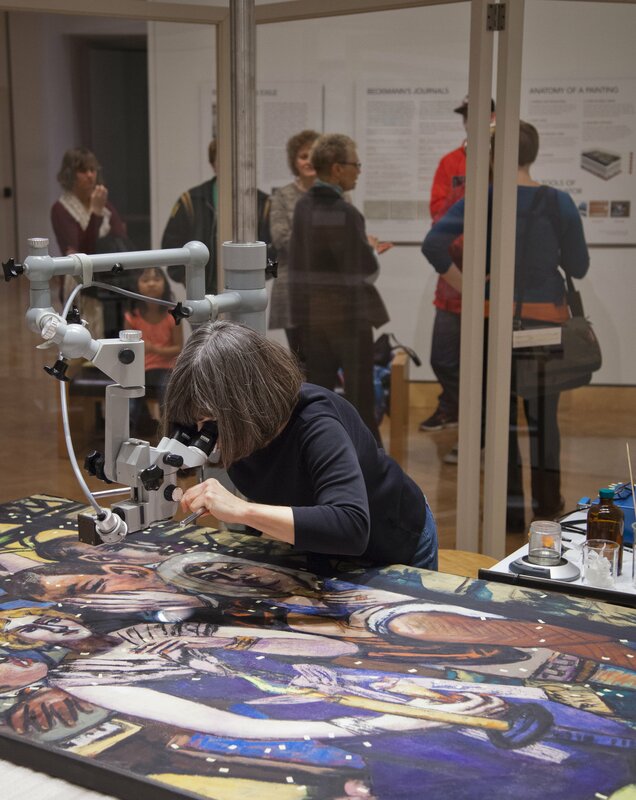 Visitors to the Minneapolis Institute of Art could observe each stage of the restoration process, as the conservators restored the painting to its original appearance of 350 years ago. This exhibition was made possible with generous support from American Express, the Samuel H. Kress Foundation, the Marbrook Foundation, and the Paintings Curatorial Council of The Minneapolis Institute of Arts. 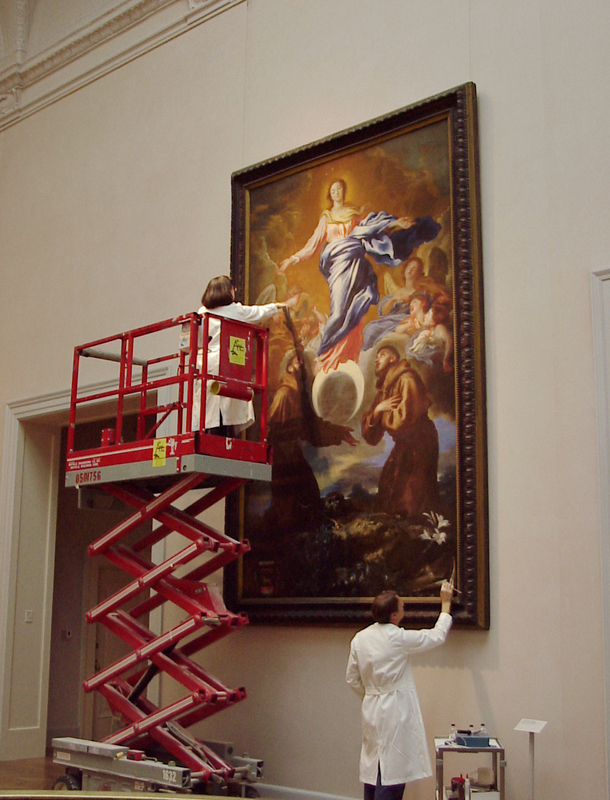 Over the course of 7 weeks in the fall of 1999, members of the Midwest Art Conservation Center cleaned and restored Giovanni Benedetto Castiglione’s The Immaculate Conception with Saints Francis of Assisi and Anthony of Padua, a masterwork and one of the largest paintings in the Minneapolis Institute of Art’s collection. The painting had undergone changes due to aging, deterioration, and damage in the 350 years since its creation. These ongoing changes necessitated restoration measures in the past, and thus the treatment may be the painting’s third or fourth major conservation. Even though a painting and the materials added during conservation age as one, the materials added to the Castiglione during old restorations had become problematic. All of the above factors produced condition problems that necessitated both structural and cosmetic changes.